October 12, 2010 Vancouver, B. C., Canada - Since June 2010, at least nine half-cats have been reported to the Royal Canadian Mounted Police in the White Rock, Langley, and West Vancouver regions around Vancouver, British Columbia. No photographs of the current cat victims are available, but today I interviewed one of the investigators, Sgt. Peter J. Thiessen, Senior Media Relations for the Lower Mainland District of the Royal Canadian Mounted Police in Surrey, B.C., Canada. (bottom red circle) has also had several half-cat mutilations over the past couple of decades. Sgt. Peter J. Thiessen, Senior Media Relations Officer, Lower Mainland District of the Royal Canadian Mounted Police, Surrey, British Columbia, Canada: “I first became aware of the half-cat problem several weeks ago in July 2010 when we had several reports in White Rock, British Columbia (southeast of Vancouver and northwest of Bellingham, Washington). 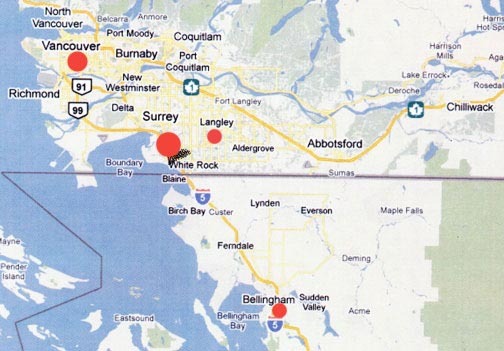 White Rock had three separate half-cat incidents over several months. 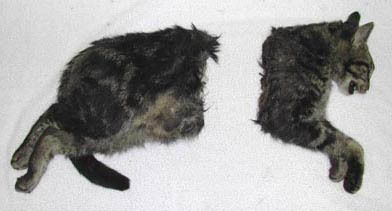 Then I became aware that another adjacent community, Langley, outside of Vancouver, B. C., had five similar half-cats in the weeks of July and August 2010.